I still feel shaken. That is how powerfully strong this book is. 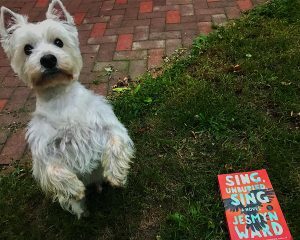 I believe it is a sign that I am reading this book, “Sing, Unburied, Sing” by Jesmyn Ward now, and also that it is being released on September 5th, in just a short few weeks. This is ironic because only a couple of days ago, it became national news that we are still dealing with racism in our everyday lives here in America. Jesmyn Ward’s book touches upon this very topic along with other struggles like poverty, drug addiction, and family dysfunction when she tells a story about rural Mississippi, past and present for one particular family. Jojo has just turned 13 years young and he is essentially a father figure for his baby sister, Kayla. This is due to the fact that their father is in jail for drugs and their mother, Leonie, is barely able to take care of herself, let alone two children. The three of them live with Leonie’s parents’ Mam and Pop near the gulf in Mississippi. Despite Mam dealing with terminal cancer, this isn’t the hardest road the family has gone down. Their first son Given, Leonie’s older brother, was shot dead because of the color of his skin. Apparently you can’t help who you love, because Jojo and Kayla’s father, Michael, just happens to be the cousin of the shooter. Yes, they are a biracial couple that are trying to push through life loving one another despite the community’s discouragement. The drugs being swapped between the two does not help by any means. Their paths are most definitely seeming like an uphill battle. The writing is exquisite. I sometimes was reading over certain sentences because the wording was like poetry. I highly recommend this book just for that sole reason alone. The story is extremely troublesome. My heart cries for Jojo. Through everything I side with him and his strength at 13. If I saw Leonie on the street I would just keep on walking. Her infatuation with Michael and her lack of caring for her children is AWFUL to read. Again, I understand that this is a story so I shouldn’t take it to heart but it just attests to how wonderful Ward’s writing is that I was getting this intense reading over a fictional character. A real eye opener (not the first) for someone like me who lives a sheltered life. This book will be very well received when it comes out on September 5th.